If you're the type of person who loves to cook with recipes, I'll bet that you'll also love The Designing with Recipe Book by Autumn Leaves. It offers the ingredients and preparation instructions for a great layout EVERY time...no guess work involved here! In the final chapter, there are layouts with as many as 15 photos!! At the end of each chapter, there is also a 'bonus' layout with a recipes for two variations. It's always nice to see how the same sketch or recipe can be tweaked and modified in creative ways to have a completely unique look. The book includes work from the following amazing artists: Cathy Blackstone, Emily Falconbridge, Jackie Bonette, Jennifer McGuire, Kelli Crowe, Leslie Lightfoot, Lisa Russo, Margie Scherschligt, Mellette Berezoski, Robyn Werlich, and Tia Bennett. In all, there are 93 layouts - some traditional, some hybrid and some entirely digital...and all inspiring! 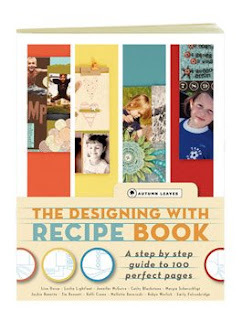 Visit the The Designing with Recipe Book by Autumn Leaves page at Scrapbook.com (not available at Amazon). You can also read more of my reviews for other recommendations.